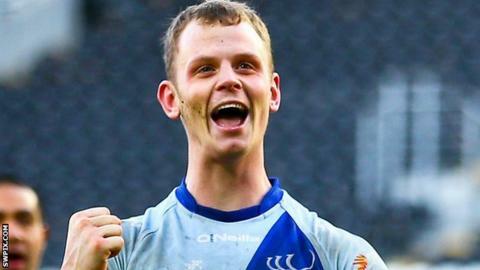 Captain Kevin Brown inspired Widnes Vikings to only their second Super League era victory against St Helens at the Select Security Stadium. Brown was influential as Rhys Hanbury's brace added to tries from Willie Isa, Alex Gerrard, Paddy Flynn, Chris Dean and Macgraff Leuluai to seal victory. Saints responded through Sia Soliola, Mose Masoe, Paul Wellens, Tommy Makinson and Lance Hohaia. The defeat knocks St Helens off the top of the table. Denis Betts' Vikings were well beaten by rivals Warrington on Friday but fronted up at home to return to winning ways. Meanwhile Nathan Brown's side, who saw their 100% record ended at home to Wigan on Friday, were without regulars such as Jonny Lomax and Luke Walsh - perhaps with next week's Challenge Cup fixture against Leeds in mind. It was the Vikings who started impressively and they were 12-0 up midway through the half. Hanbury touched down after Brown opened up Saints on the left-hand side, and after Chris Dean's effort was chalked off, Cameron Phelps teed up Isa to crash over out wide. Matt Dawson went off injured for Saints, forcing Soliola into the centres for a spell and the Samoan bashed his way over after impressive work from Andre Savelio. Gerrard went in from Lloyd White's pass but Saints ended the half strongly with quickfire tries from Masoe and Wellens to make it a two-point game at the hooter. Flynn got the first try of the second period for Widnes but again the Red Vee came back, Makinson adding to his catalogue of spectacular finishes with a try out wide. Dean eventually crossed on his third attempt and after Hohaia's try again sparked hopes of a St Helens fightback, Leuluai steamed in to settle the result for the Vikings. "These Monday games can be a bit of lottery as you get beaten up on a Friday and then you go again. The majority of the lads who played on Friday against Warrington put their hand up to play again, and that was a really pleasing thing for us. "I thought the lads who came into the side - Grant Gore, Macgraff Leuluai and Paul Johnson - really gave us a lift. They had a lot of energy and they came into the team with some real purpose. "I'm really pleased with the victory. It's the first time we've beaten them here at our own ground - we've come really close a few times but not got over the line, so today to do that is great." "With four or five minutes to go, we were still in it, but the score probably reflected the game. Our start to the game is an issue. We have not started games well at all. "Whether it's kick-off, bomb or anything - we start the game very poorly and we have to look at it. The guys had plenty of fight in them - 18-4 down and we fought our way back - but credit to Widnes. "The thing with Easter is that everyone is in the same boat. We had 10 lads who didn't play today but we are playing Leeds this week and we have a lot of injuries and that's just the way it is, but we will get some benefit of them not playing." Widnes Vikings: Hanbury; Flynn, Dean, Phelps, Owens; Brown, Gore; Kavanagh, White, Johnson, Galea, Tickle, Leuluai. Replacements: Cahill, Isa, Lawton, Gerrard. St Helens: Hohaia; Makinson, Wheeler, Jones, Dawson; Wellens, Wilkin; Masoe, Fozard, Walker, Greenwood, Soliola, Thompson. Replacements: Tilley, Savelio, Hand, McCarthy-Scarsbrook.